Every boy needs a furry friend and this gift covers all the bases! The Puppy Pal Layette Baby Boy Gift is packaged in a beautifully embroidered blue box with fun patterns that look adorable upon arrival. The Pink Bunny Baby Girl Layette Gift Set is the perfect gift that any new parent will fall in love with! Packaged beautifully in pink embroidery, this gift package comes with a cute bunny that makes for the perfect first plush toy. Make any newborn go nanas with the Jungle Themed Layette Baby Gift Set! 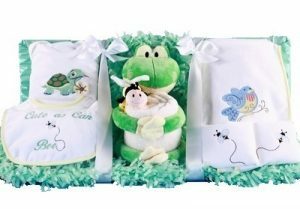 This is the cutest gender neutral gift set decorated with adorable animals on each item like crocodiles, tigers and monkeys. Show new parents that their baby is “As Cute As Can Bee” with this gender neutral baby gift. This package comes with towels, bibs, and other baby gifts all packaged in an adorable gift set. Picking out the perfect baby gift set for a spring baby shower or baby birthday doesn’t have to be hard! Visit BisketBaskets.com to find more baby gifts and unique gift baskets for any occasion or holiday.